i have some response (+, -, !) to it, but in-depth review, commentary, and altogether highly subjective and taste-tinged writings on the patterns forthcoming, by yours truly. however, in a clicking haze, i meandered to morehouse farm merino and found this gorgonian shawl. 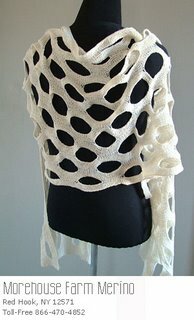 if you take away the gallery-owner shawl-like styling and scrunch it up into a massive scarf, i think it is a gorgeously fun thingy to drown your tender neck in. not only is the name of the pattern awesome (ai! medusa! ), but it reminds me a lot of diana‘s mathematical scarves. the colour choices for the kit are all lovey-worthy: soft white, black, charcoal, and salmon. the white is cute but sort of reminds me boiled beef tripe. (tasty.) the black would be elegant but a little blah. charcoal would be more interesting, especially if it has a slight sheen, and salmon would be über-tasty… i know because i have three scarves in that colour! turning in my thesis is a prerequisite to starting anything in laceweight. make that known now! >That’s a unique scarf/shawl. I can totally see you wearing it! >thanks a LOT. now i want to make something like that. in scarf form of course because shawl is too.. bleh. what weight do you think it’s in? >why must i perpetually ask questions before clicking links? this is TWICE in the past 20 minutes. someone stop me.